OUR SKIRRETS WERE FEATURED ON BBC TWO’S GARDENERS’ WORLD WITH MONTY PLANTING OUT OUR SKIRRET CROWNS IN HIS TUDOR VEGETABLE GARDEN. More info here BBC Gardeners World. Latin name Sium Sisarum, Skirrets are hardy perennial root vegetables. They date back centuries, pre-dating the potato, and were one of the main root crops eaten across Europe before potatoes were introduced. They fell out of favour because potatoes were easier to prepare, not because of the taste. Skirrets actually taste somewhere between a Parsnip and a carrot with a hint of pepper. Grown in the Tudor and Stuart periods through to the 1750’s they were used in sweet & savoury dishes and such things as ‘Skirret Pye’. By the 19th century all mention of skirrets was gone from the records and cook books of the day. You can grow Skirret from seed either direct or in modules in March/April or to get a head start plant a 1 year old crown that already has a cluster of baby skirret roots forming. Plant in a sunny position about 30cm apart. You will see little green shoots emerging and over the summer the plants will get to about 4ft tall producing umbels of lacy white flowers. In the Autumn the foliage dies back and you can check to see what the roots are doing and harvest some for eating and divide the rest to make new plants. Pick the straightest, largest roots and those without a woody core to make new stock. You can also make new plants from little offsets – these are growing tips with a little bit of root attached, just pinch off and pop into a pot. The Skirret will self seed as well. 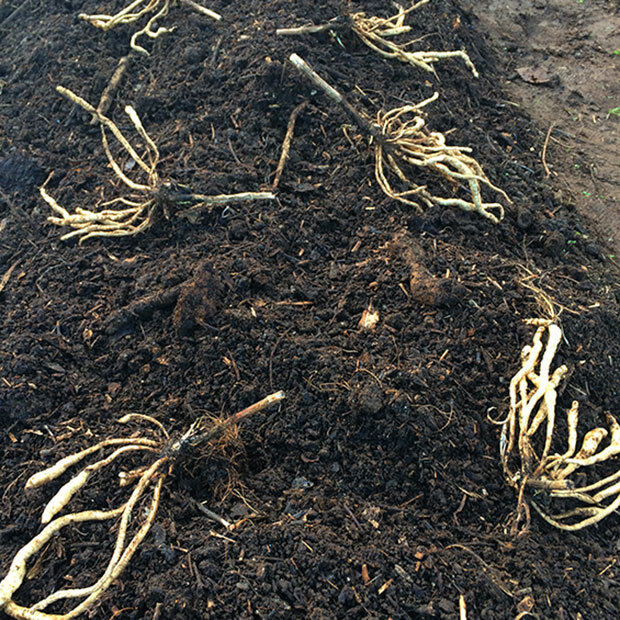 The first years roots may be a little woody, but once established you should get sweet, tasty roots to harvest. It is usually best to wait until the second year for larger eating roots. Skirrets like rich deep soil with lots of organic matter, but soil that is friable. They need to be well watered to stop the roots from becoming tough and enjoy some liquid feed. The flowers are beneficial for insects. Use Skirrets raw as a munchable snack, or parboil and deep fry, or roast in the oven with olive oil. They also make a lovely soup. 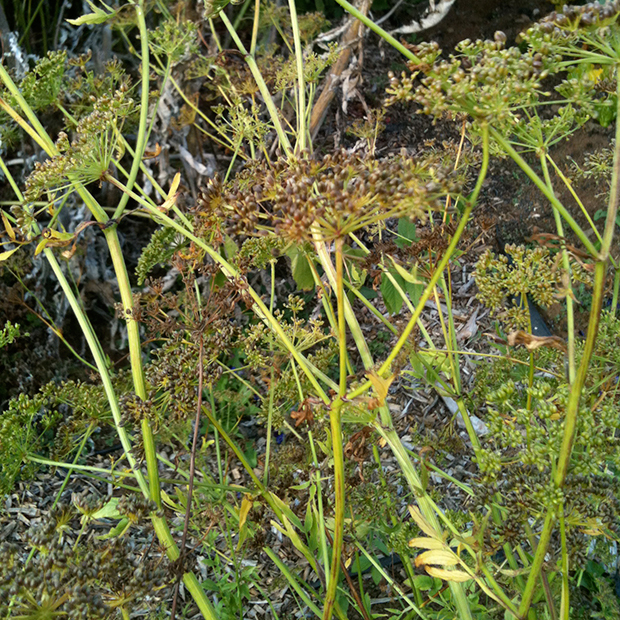 Other uses are skirret pasties, skirret rostis, or sautéed in butter and fresh parsley. They turn quite gooey and unctuous when cooked. 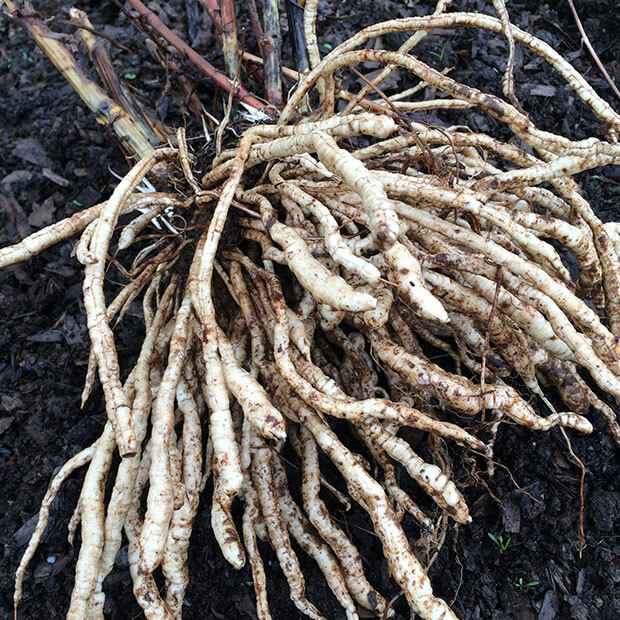 A freshly harvested skirret plant. After just two years quite an abundance of sweet and tasty roots to eat.